What is the status of emotional intelligence in the world today? For the first time ever, a view of world-wide data on key strengths and weaknesses, opportunities and threats for EQ globally. Drawing on a database of over 75,000 assessments, a global sample was created to generate a balanced basis of comparison of EQ in 2011-2013, in the 3 regions of the world: APAC, AMER, EMEA. 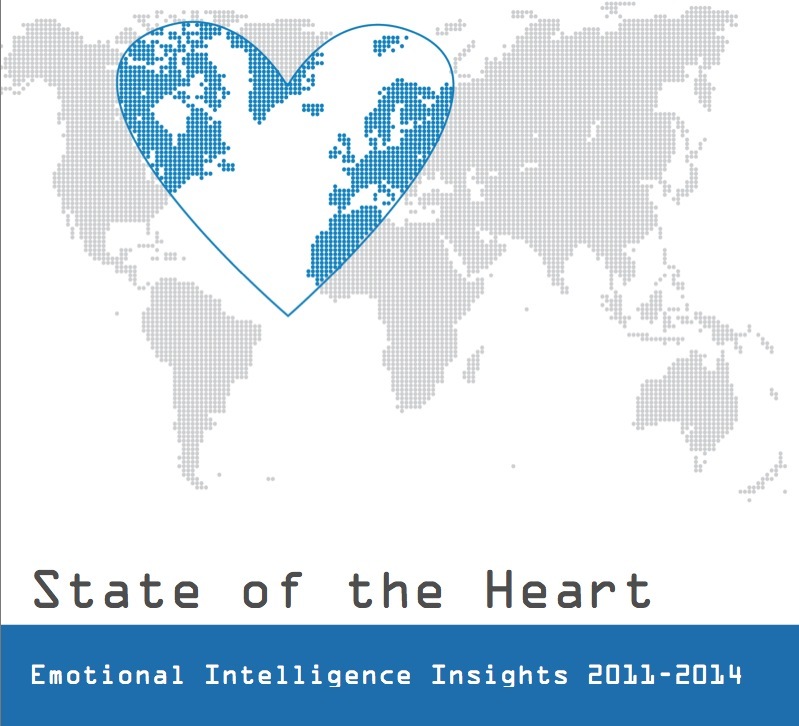 Globally, emotional intelligence is declining. The 2 key talents for 2014: Entrepreneurship and Imagination. Men and people over 40 have an edge. Women & men, younger & older have OPPOSITE EQ strengths & weaknesses. EQ is a driver for sales & service. Two keys: optimism & intrinsic motivation. Top talents for innovation vary by region. EMEA: Proactivity, Connection. AMER: Data Modeling, Resilience. APAC Adaptability, Designing. In each world region, emotional intelligence is a key driver of performance, highly correlated with outcomes such as influence, decision making, quality of life, and health. I agree with you that ei drives performance in all regions of the world but the effect is waning in most states of Africa as people are continuosly been pauperized due to corruption and harsh economic climate. The stress level has so increased, particularly in the urban areas that most have little or no time to read the emotions of their peers. The conclusion is inescapable that emotional mismanagement is the order of the day. How will Africa be helped? Awesome report and the webinar! It would be interesting to collaborate with other expert who has other assessment tools and data and cover the wider population in the research. What concerns to me about the positive intelligence doe to other factors that society have now in the political situation specially in south america. Countries as Venzuela, Ecuador, Argentina, Bolivia, Chile, Brazil, are going down and over a “way” to kill some principles of human wrights- our society is in extreme situations and psycologilcal bad conditions, trying to survive with the corruption and “rules” which are being designed to put as aunder the power of the policies that only “works” for them and into the society, we are under a presions of many unspected ways to go ahead of the future. we are under the fire, so, thats change our psycological performance. We are not free, so we are death and nobody looks, see or understand what happen, even institution as OEA are under the fire “The power of hate”, craszy people that can no not see what is importan to life, so, psiquis it is not important for our world? how can we lieve like that and be healthy? The findings about men-women EI was fascinating: has the competition forced the women ( who compete as equals with men) to be emotionally the same as men? is this hardening of the ‘softness’ associated with women creating stress for the women? Has the violence in the society and the need to protect themselves harden women? Hi Pavel – thank you – and yes, I agree it would be powerful to have participants in EQ Week share perspectives — and I love the idea of looking at this SOH data in light of macro economic, social, and environmental changes. Given the fabulous work Six Seconds has done worldwide, I found it surprising that total EQ dropped steadily from 2011 to 2013. I am wondering if there are other reasons for this apparent drop in EQ skills rather than an actual drop in EQ skills. Perhaps the persons taking the SEI back in 2011 were among the “low hanging fruit” – people that had higher EQ, a stronger interest in EQ, and were earlier to get involved in the study of EQ. Perhaps it is more an issue of market saturation. People that took the SEI later may have been more on the fringe of those having an interest in developing EQ. Perhaps another possibility is that greater EQ awareness has led people to rate themselves lower than they would have two years earlier. The more we learn about EQ, the more we learn that we do not apply it as much as we would like to, or formerly thought we did. The brain styles information was also very interesting. There seems to be brain style overlap. For example, the Sage (most frequent brain style in Asia-Pacific) is future oriented while the Visionary (least frequent brain style in Asia-Pacific) is long-term. The same pattern holds between the least and most frequent brain styles in the other two regions, with seemingly very similar characteristics revealed in the both the most frequent and least frequent brain styles. Lastly, I appreciated the divergence shown with respect to age, gender, and region. This is solid evidence favoring diversity (and EQ) in any organization. Thank you, Josh and the Six Seconds team! Hi Josh, The report is exhaustive & gives some concerns .I do agree with the results. Yes, today, I find young generation more volatile & jumping to conclusions abruptly. I find today, collaboration among colleagues/C-F teams a big challenge.Also, innovation or out of box thinking a rare commodity. We have to seriously analyse the facts & work on weaknesses to improve. Thanks Teresa – the data is from the “SEI” assessment, http://6seconds.org/tools/sei, a robust, normed emotional intelligence assessment that helps people put EQ into action. The collection is through a wide range of projects by Six Seconds and our certified assessors around the globe, and represents a highly diverse sample — but, as shown in the report, it’s slightly weighted toward working adults and educated professionals as that’s the majority of the client base. Hi Joshua — always grateful for this kind of research! It’s a very intricate report with all minute findings. Thank you for such a grand work. I am continuously applying it in my work. Great job.I am convinced with the tremendous work being done by Six seconds and thinking to organize one program for our officers at higher level to better understand the attributes of highest performing people to thrive and excel professionally and personally in a holistic manner.